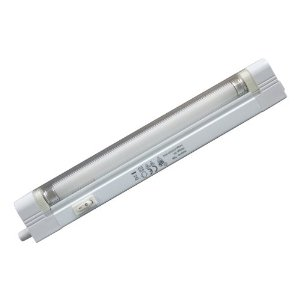 These Knightsbridge Linkable T4 fluorescent fittings are ideal for home and commercial use for kitchen worktops, in cabinets, under stairs, as a pelmet lamps, or to create a well lit work station for DIY, craft, or commercial use. Available in a range of wattages and lengths, these fittings are a simple and easy cost effective solution to a wide range of home and commercial lighting applications. Up to six units can be linked together with direct connection or link leads, which can be ordered seperately. Each unit comes supplied with a T4 4000K cool white tube, diffuser and 2 metre mains lead (bare end) to 2 pin inline socket. Unit has a bracket for wall/ceiling mounting and 10 fixing clips for the diffuser. Manufactured to Energy Efficient rating L1 and CE approved. This product comes with a 1 year manufacturers guarantee. Additional Link Leads or Replacement Tubes are also available. Replaced the old version I had which was shorter, clipped straight in to existing holder clips and power supply and worked. I then swapped the old clips for the new ones as they were cleaner. Prompt delivery. Would use again. Two strip lights to replace old tubes in our bathroom cabinet. Perfect!! Great customer service ensured a perfect fit when replacing one link in a chain of six-year-old concealed lights.